Here comes a tale of technology. Sometimes technology is good, sometimes it’s bad, and other times, it’s confusing. The tech confusion, in this case, started with a self-pay parking fee kiosk. And it led to questions about why the state’s municipal courts don’t use technology to lower the number of court appearances by ticketed drivers who want to plead not guilty. Now, we have no beef with a required court appearance for driving drunk or other serious offenses. But if someone wants to fight a parking ticket, do they really need to show up in court? In New Jersey, in most cases, you do. This came to Bamboozled’s attention when Larry Zisman, 75, got a parking ticket at the Princeton Junction train station. 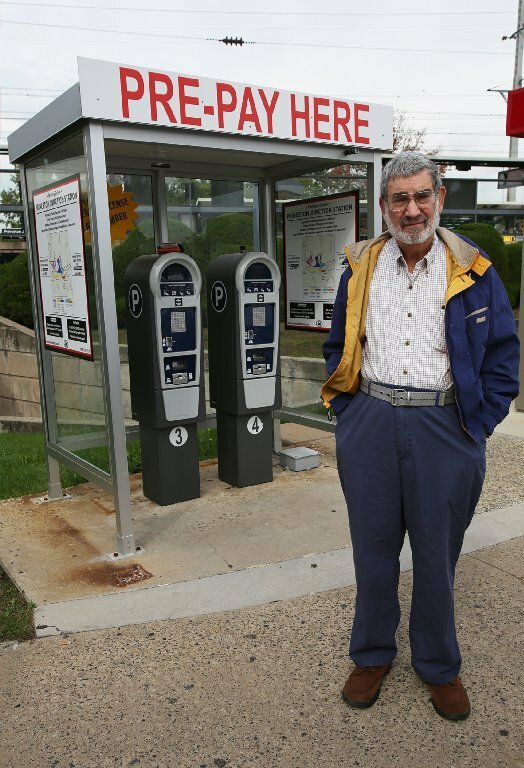 Several months ago, the East Windsor man parked at the West Windsor Parking Authority lot, and he paid the $5 all-day parking fee at a ticketing kiosk. To use the kiosk, you’d enter a license plate number, how many days of parking you need and then you’d pay with cash or a credit card. Zisman did all that, but he inadvertently left off one letter of his license plate number. He got a ticket for $60. He thought he could send in a copy of his parking receipt with a not guilty plea by mail so he wouldn’t have to appear in court, but that wasn’t an option on the back of the ticket. Zisman said he called the parking authority and the municipal court. Both confirmed he’d have to appear. He did, and the case was dismissed with no penalty and no court costs, Zisman said. On Oct. 2, in the same lot, Zisman got another ticket. At the payment kiosk, he wanted to be meticulous in entering the license plate number, so he entered “NJ” and then the license number, he said. He called the parking authority to ask why he received the ticket. It was because he entered “NJ” with his license plate number. The scanning camera used by officers would show it as an incorrect number, he said he was told. Zisman, again, would have to appear in court. That’s won’t be until December because Zisman was unavailable for the initial court date. Zisman believes his ticket will once again be thrown out. But, he said, his experience brings up questions about whether the parking kiosk instructions, the tickets themselves and the inability to dispute a ticket by mail or online makes sense. Or are drivers being Bamboozled? “In this day and age of extraordinary communications and documentation… If certain cases were settled without a court appearance, court sessions would be shorter,” he said. He also noted it would help those who work long hours or have child care or elder care responsibilities. “I realize that appearing in court for a parking ticket is not a major unpleasant life-changing experience or a crisis facing the nation… but if life could made easier, less complicated, and, if I may say, more reasonable, why not do it?” he asked. 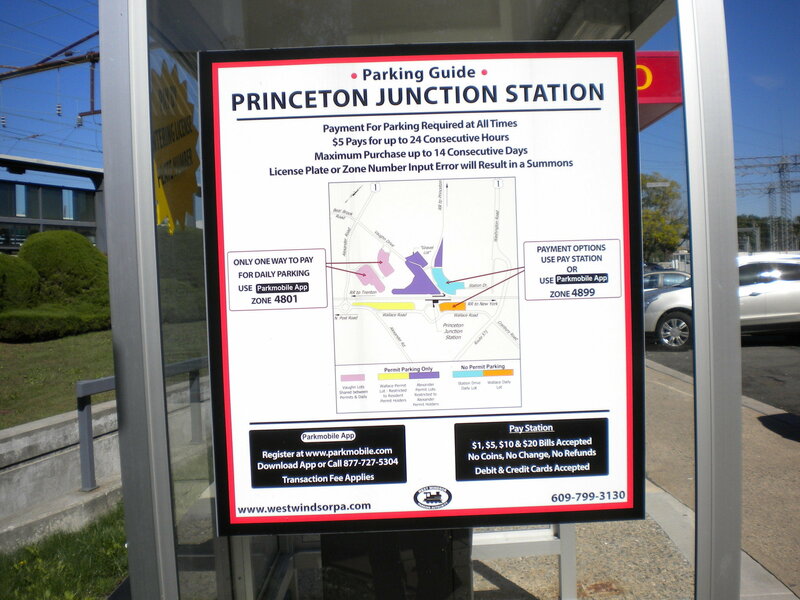 Princeton Junction is the fifth busiest rail station in New Jersey, with an average 6,968 boardings every day. 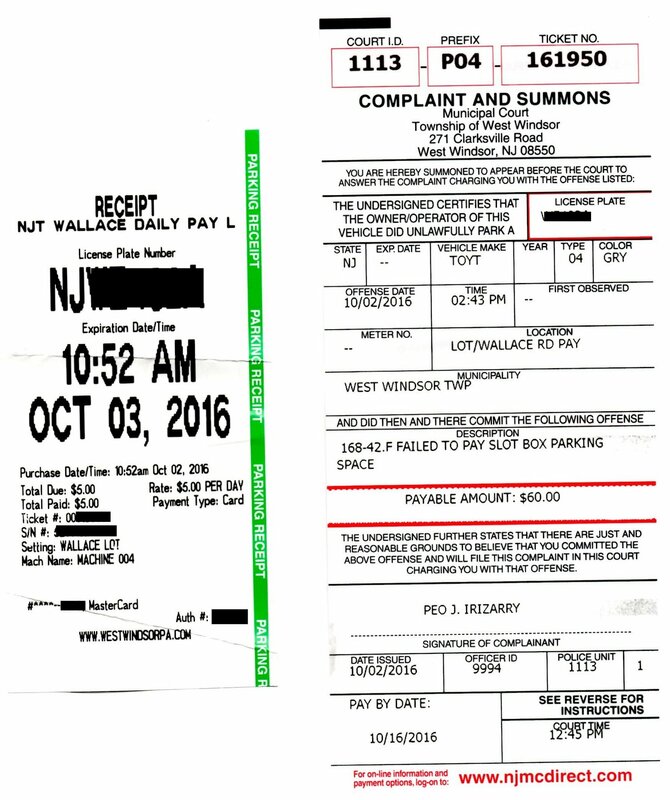 The West Windsor Parking Authority, which runs the lot, says about 400 of its 20,000 parkers each month get tickets from parking authority officers. Some are for not paying the parking fee, but others are for parking in a handicapped spot or parking over the lines and taking more than one spot, spokesman Scot MacPherson said. MacPherson said approximately 20 ticketed drivers each month go to court with a not guilty plea, but he didn’t know how many were like Zisman’s. MacPherson said the lot’s parking enforcement officers, empowered by the township to ticket in lots, use a license plate recognition scanner. “Once you enter the license number into the terminal, it transmits to our servers,” he said. That goes to the officers, and as they drive by, they are alerted if something doesn’t match, he said. And that’s what generates a ticket. Now yes, Zisman did make a mistake when entering the plate number — both times. But it seems tickets like these, and a court appearance, could be avoided if the officer took a moment to look at the license plate number. It would have been easy to recognize that an innocent mistake was made. This is a time when human eyes would make a difference, and save time and money for the court system. Zisman’s ticket gave him the choice to plead guilty by mail, or not guilty with a court appearance. If he had received the ticket in New York City, he’d have the added option to plead not guilty online or by mail. Online and by-mail pleas require the driver to offer the ticket, the proof he wasn’t guilty and copies of any evidence. After review by an administrative law judge, you’d get a decision, again, by mail or online. We wanted to know if any municipalities in New Jersey offer the same. “Disputing tickets online is not available online in New Jersey, but it is something that is being discussed,” said Pete McAleer, spokesman for the state judiciary. He couldn’t give a time frame for when online disputes might be available. “Disputing by mail is available in every municipality but you have to contact the [court] by phone first,” he said. We asked Steve Carrellas, government and public affairs director for the New Jersey chapter of the National Motorists Association, for his take. Carrellas said disputing by mail or online could be a disadvantage to motorists. But this doesn’t always transfer to a dismissed ticket, Carrellas said. Carrellas recommends you call and ask the court if you can plead not guilty by mail. Depending on the cost of a parking ticket, mail might be a good idea if you look at the cost of your time to appear in court, he said, but, if your objective is to win and if your case isn’t clear cut, fight it in court because a by-mail decision is final — with no do-over. Zisman will indeed appear in court. “There was no option on the back of the ticket to dispute the ticket by phone, email, Skype, carrier pigeon, mental telepathy, psychic, or by mail,” he said. He’s hoping the state will make the acceptance of not guilty pleas by mail or online the norm.